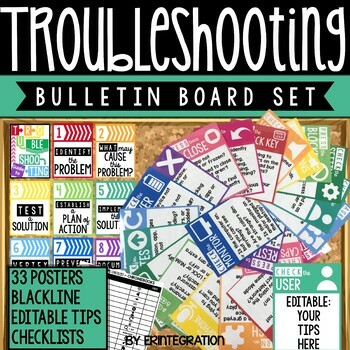 Teach students technology troubleshooting skills with this bulletin board set. Includes posters with the technology troubleshooting 10-step process as well as 22 common troubleshooting categories and tips in both color and 2 types of blackline for printing options! 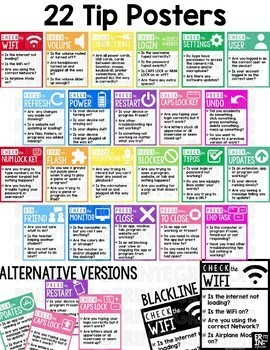 Also includes blackline checklists for students to complete for various devices too! Posters can be printed up to 8.5 x 11 inches for a bulletin board or print smaller and attach to a ring for a quick guide. Troubleshooting tips are written for a variety of devices - print what you want for use with Chromebooks, iPads, PC, Desktop, Laptops, Tablets, etc. You can also EDIT the tips RIGHT in the PDF or use the included PowerPoint file to use your own fonts. ★ 10 Step Technology Troubleshooting Process Posters in both color & blackline. 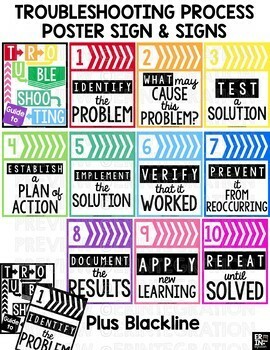 ★ 22 Technology Tips Posters in color & blackline - includes a common "thing to check" with an icon as well as questions students can ask to narrow down the issue. Tips are written for a variety or devices and alternatives icons are included when applicable. ★ Editable set of Technology Tips Posters for you to add your own questions or tips either in PPT or right in the PDF.